Lower leg cooling with ease! Suspensory Wraps (use to be called Evendura Wraps) provide coverage from just below the knee along the entire cannon, pastern and fetlock areas and rest on the coronary band covering the entire length of the suspensory ligament. Wraps fit both front and hind legs and are great for treating Suspensory Ligaments injury and Deep Digital Flexor Tendon problems. Daily use controls heat swelling & inflammation post workout. 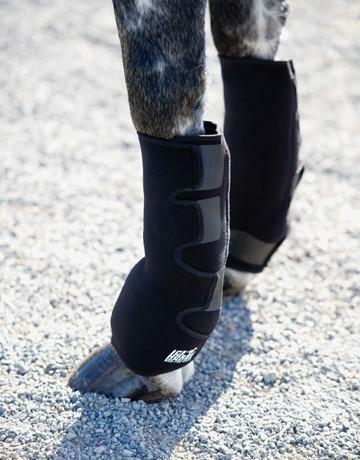 Easy to use Ice Horse® Wraps with reusable Cold Capture ice packs provide uniform compression and coverage to reduce inflammation and heat starting from below the knee through the tendon, fetlock and pastern areas. Cold capture Ice packs are reusable. When you are done, simply place your packs back in the freezer. Within hours they are ready to use again. Ice Horse Evendura Wraps are made with Quadrispan™ a non-neoprene anti migration fabric. Our unique breathable fabric keeps the wraps in place on the horses leg and the ice compressed against the area being treated.